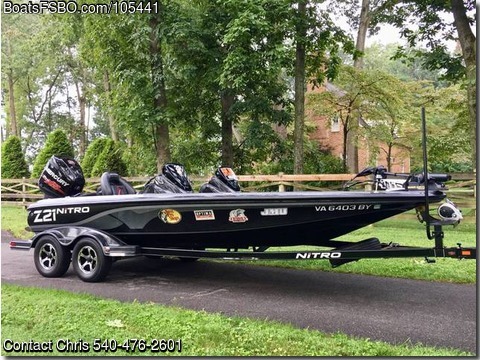 Contact the owner Chris @ 540-476-2601 with any questions...2016 Nitro Z-21 DC , 250 Mercury Pro XS Torque Master with 60 Hrs. 12" Slidemaster Jack Plate, MK Fortrex Trolling Motor, T-H Hotfoot, 4 Bank Charger, Storage Fan System, Oxygenators, Lowrance HDS 9 Touch Console & Bow W/Structure Scan. Tandem Trailer With Disc Brakes, Custom Nitro Trailering Cover, Custom Colors, Boat Is In pristine Condition.